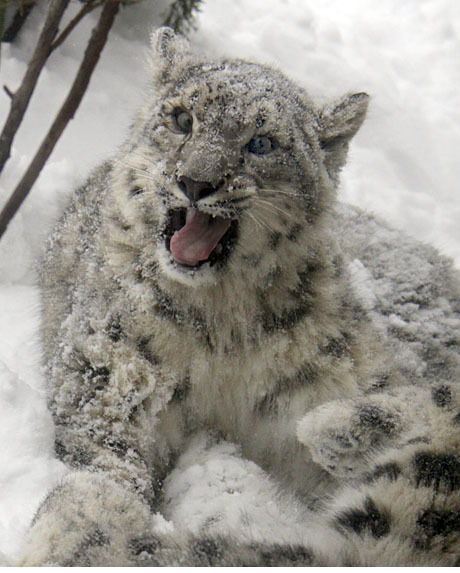 I was not planning to go to the zoo on Friday’s very cold day but the lure of freshly fallen snow and the thought of snow leopard cubs frolicking in the snow was too much for me to resist. Enjoy their antics as well as some other familiar zoo faces in the beautiful fresh snow. If you haven’t come to see these seven month old cubs yet – now is the perfect time to catch them in all of their kitten-like friskiness. Love the shots of the snow leopards, they look like they’re having a ball! Happy New Year! Fun in the snow is much better than fun in the sun! Thanks for liking my somewhat tamer posts! Very nice. Brought a smile to my face. Thank you. Wow! Fantastic pics as always, what a great time the animals are having…I used to tell people when selling memberships that winter was a great time to visit…your pics prove it! Fabulous pictures of the snow leopards. Thanks for NOT staying indoors on Friday. beautiful! and notice snow around animals doesn’t get icky gray like snow amongst us humans …..